WORLD'S BEST 1000m SPRINTER !! SILENT WITNESS has confirmed his 2003 title as the World's Best 1000m Sprinter with a resounding victory in the $HK10 million Hong Kong Sprint at Sha Tin today. 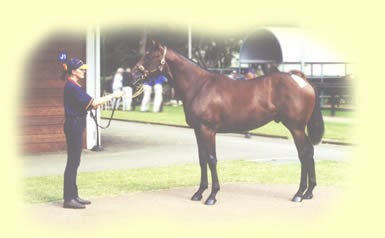 Edinburgh Park Stud sold SILENT WITNESS as a yearling at the 2001 Inglis Classic Yearling sale for $55,000. Read 2001 sale results - click here. 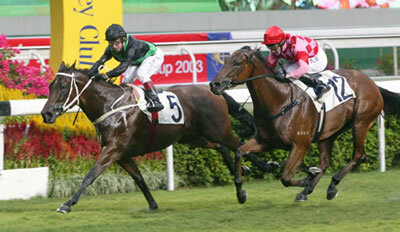 The duel materialised, the hype was justified and SILENT WITNESS, the best horse in Hong Kong, came out on top. The overwhelming favourite SILENT WITNESS drew out for a length success from National Currency, the much-touted South African challenger, in the HK$10 million Hong Kong Sprint (Gr.1-1000m) to bellowing roars of approval from the huge Sha Tin crowd. 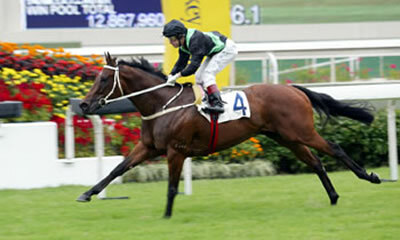 Hong Kong runners Cape of Good Hope and Firebolt finished third and fourth respectively. Owned by Archie da Silva, trained by Tony Cruz and ridden by Felix Coetzee, it was SILENT WITNESS' eighth win from as many starts. "There was a lot of pressure but obviously I feel better now, "said Cruz. "He's definitely the best sprinter in the world, and he has proven what he all felt he was capable of. He will stay here for the Champion Sprint Series and, in doing so, try to break the Hong Kong record of ten wins in a row that was achieved by a horse I rode, Co-Tack." Cruz did not rule sending SILENT WITNESS on overseas missions in the future. Disputing the early running, SILENT WITNESS, backed into long odds-on at 1.3, and National Currency eyeballed each other through the first 500m of the world's richest five-furlong dash. "National Currency led me by about a length early on but my horse was always travelling comfortably. As soon as I got upsides at about halfway I knew I had him. SILENT WITNESS just has everything, it's a great privilege to be on one as good as him" Felix Coetzee said. 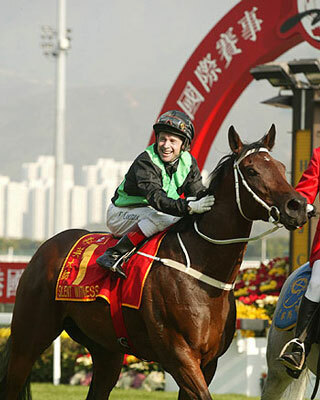 Jockey on the runner-up, Weichong Marwing said: "He ran his heart out, he ran really well. He just met a better horse. I have no excuses." SILENT WITNESS devastates Hong Kong's best !! Jockey Felix Coetzee doesn't know how good he is? SILENT WITNESS conquered all his local Hong Kong Sprint contenders in the most hollow fashion at Sha Tin yesterday, but the damage he inflicted on our fastest horses still failed to provide a definitive measure of his prodigious talent. "He was leading comfortably and then at the 400 metres, he took time to have a look at the ambulance inside the running rail," Coetzee explained. "Then I realised he was bludging, so that's why I shook him up and made him race. "He's won easily, but there is still more improvement to come. I've never ridden anything like him . . . nothing else even comes close." Trainer Tony Cruz doesn't know either. "In my career as a jockey, I never rode a sprinter as good as him," Cruz said. "He is just an amazing horse, and I still have three weeks to get him ready for the Hong Kong Sprint. It's a perfect gap between races." Jockey Club senior handicapper Ciaran Kennelly is the weights and measures man, and he suspects he's being too conservative. "He's a very fast horse, that's for sure," Kennelly said with typical understatement. "After today, he'll be the highest-rated horse in Hong Kong . . . probably with a rating of 131 domestically and either 118 or 117 internationally. "He'll definitely be the highest-rated horse in the Sprint, and that includes the international horses." SILENT WITNESS worked to his usual gameplan in yesterday's Group Two, $3 million International Sprint Trial - go to the front, turn on the turbocharger at the 400 metres, hit the finishing post well in front and count the bodies later. On this occasion, the margin was 2 1/2 lengths over the fast and admirable Cheerful Fortune, with the consistent Firebolt another 1 1/2 lengths away third. The winner's time was a zippy 56.3 seconds, but was not an accurate guide because he was under so little pressure for the first 400 metres. Owner Archie da Silva was not trying to be boastful or excessively confident when he bullishly began looking beyond the $10 million Hong Kong Sprint (1,000 metres) in three weeks' time with even more tantalising long-term goals for SILENT WITNESS. "Naturally, we want him to win the Sprint and make Hong Kong proud," Da Silva began. "That would be his eighth straight win and if he does that, I'd really like him to equal and then break Co-Tack's all-time Hong Kong record of 10 successive wins. 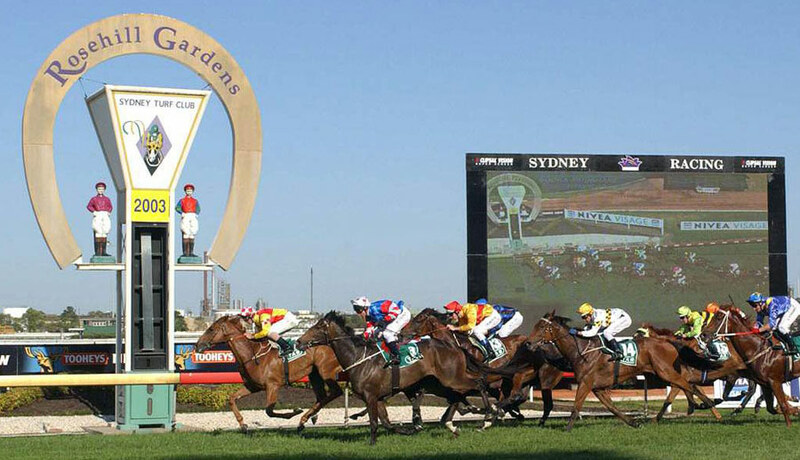 "Then next year, there are the three Group One races of the champion sprinter series. That's where he's headed." Magic Marvo wins at Rosehill !! Magic Marvo continued on his journey to the Villiers in December with a thrilling win at Rosehill today. 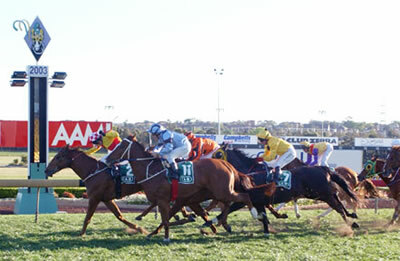 Ridden by top jockey Corey Brown, the gelding gained a split at the top of the straight and proved too strong in winning the 1400m event in class record time. He will now run in the Festival Stakes (LR) at Rosehill in a fortnight, and then straight into the Villiers. SILENT WITNESS wins Sprint Trophy in fighting finish !! SILENT WITNESS returned to racing with a determined win in the inaugural Sha Tin Sprint Trophy (Gr3). He ran the 1000m in a blistering 55.7seconds and all looks well for his attempt to win the Group 1 International Sprint in December. Magic Marvo - back with a BANG !! Magic Marvo (Bite the Bullet (USA) - Day County) pulled one out of the bag at Canterbury today. Expertly ridden by Darren Beadman, he won with a touch of class and showed the trainer, Rod Craig, that he has come back a stronger horse from his spell. Previously to today's win, he finished a powerful 2nd first up at Canterbury a fortnight ago. He will now be set for the Group 2 Villiers in December. Princess Tinkabell adds to growing list of Edinburgh Park Winners !! Princess Tinkabell (Zeditave - Review (NZ)) saluted the judge at Hawkesbury today in strong fashion. The speedy Filly is the 3rd foal out of Review (NZ) who is the daughter of multiple Group Winning CHALEYER. The future looks very bright for this filly as her two older half siblings are both Group Winners and she is prepared by an excellent conditioner in Gerald Ryan at Rosehill. SILENT WITNESS was nominated today by the Hong Kong Jockey Club for both Champion Sprinter and Champion Griffin for the 2002/03 season. SILENT WITNESS is now rated 125 on the Hong Kong scale and is assured of Champion Griffin title, along with being one of the highest rated horses in Hong Kong. The Future looks bright for MATEY !! 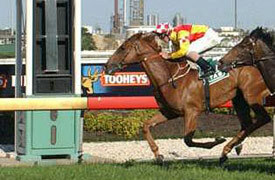 At Randwick today, MATEY (Umatilla - Daisy Cutter) ran a slashing third over 1600m. With the track appearing to be favouring front runners, MATEY came from back in the field to finish strongly down the centre of the track. This run follows a recent 2nd at Randwick in late May. Being a 2yo and by Umatilla, the future is looking bright as he matures and gets over more ground. Rod Craig purchased MATEY for $17,000 at the 2001 Classic Sale at Inglis. He will now be sent for a spell at Edinburgh Park and be set for some nice races in the spring. SILENT WITNESS Wins Sha Tin Vase !! The Saturday night meeting at Sha Tin featured the running of the Sha Tin Vase Group 2. A race billed as the "clash of the titans" with rising star SILENT WITNESS taking on the acknowledged champion sprinter of Hong Kong, GRAND DELIGHT. The much hyped event turned into a procession, as SILENT WITNESS sat easily outside the lead, before brushing off a challenge from GRAND DELIGHT to win as he liked, carving out the 1,000 metres in 57.2 seconds on a good to yielding track that was later downgraded. "He was .....just.....awesome", said jockey Felix Coetzee. "Amazing! I rode him in a canter this morning and I knew Tony had him absolutely spot on. As good as he was today, there's a lot more to come. He can just go on and on..." SILENT WITNESS. The 3yo speed merchant is now a five from five Winner with prizemoney topping $760,000. Next on the agenda for SILENT WITNESS will be a brief respite, before Tony Cruz begins a campaign aimed at the rich International Sprint in December. Is He The Next SILENT WITNESS ?! Today, Crown Rubiton was an impressive barrier trial winner at Bendigo by 1.3 lengths. Crown Rubiton is the second foal of Jade Tiara which making him a half brother to star Hong Kong sprinter SILENT WITNESS. The 2yo raced 3 and 4 deep at times in the trial but showed he was a class above his rivals as he was eased up on the line to win the trial easily. Trainer Robbie Laing was all smiles after the trial and said "the horse was very green but he showed us he's got the ability". The horse will now be sent for a spell and will be set for some nice races in the Melbourne spring. Footnote: Robbie Laing purchased Crown Rubiton (Rubiton - Jade Tiara) at the 2001 Classic Yearling Sale for $67,500. Easter Yearling Sales Debut !! Edinburgh Park has just competed their first Easter yearling sale. The gross being $90,000 with an average of $45,000. Selling the highest Bianconi yearling at the sale for $60,000 and selling a Woodman colt for a respectful $30,000. How Good Is SILENT WITNESS !! 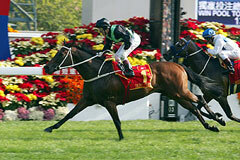 Hong Kong 23/3/2003: SILENT WITNESS. How good is he? In Hong Kong today SILENT WITNESS was devastating in recording his fourth straight win. He absolutely toyed with the class field over 1,200m in the fast time of 1.09.60sec. Jockey F.Coetzee didn't even extend this son of El Moxie fully and who knows how many gears are left. After today's win he now rates a high 115 on the Hong Kong ratings and his future is looking very bright indeed with prozemoney to date being HK$2,205,900 (Approx. $477,000 AUD). SILENT WITNESS Wins Again ! 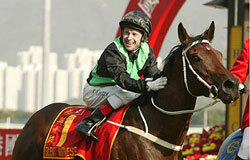 Hong Kong 23/2/2003: SILENT WITNESS wins again. Although dropping back in distance, SILENT WITNESS was all class in winning the 1,000m event at Sha Tin in 55.5seconds. The jockey F.Coetzee eased him up on the line for an easy win just outside the long standing track record. Edinburgh Park has just finished a successful 2003 Classic Yearling sale, grossing $199,000 and averaging a very healthy $33,166 (Sale average $29,812). -- Lot 134 Grand Lodge - Daisy Cutter Colt which sold for $70,000 to Justin Drake. Smashes all opposition again ! SILENT WITNESS (El Moxie - Jade Tiara) made it 2 starts for 2 wins at Sha Tin. Coming out of barrier 14 he was pressured early but showed he is all class by clearing away for an easy win by 2.5 lengths over the 1200m course. The El Moxie 3yo gelding accelerated away from the field over the final stages to record a powerful win at his first racetrack outing. He recorded a very fast time in 57.8sec for the 1000m and his winning margin of 3.75 lengths showed that he was a class above the opposition. looks to have a very bright future in Hong Kong. 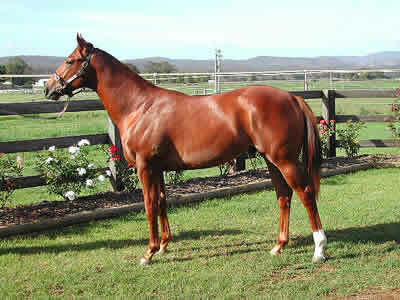 Edinburgh Park Stud sold SILENT WITNESS as a yearling at the 2001 Inglis Classic Yearling sale for $55,000. Read sale results - click here. SILENT WITNESS has a fine half brother by Woodman (Lot 239) in the 2003 Classic Sale.